In 2008, John Hagan took the helm as Manomet’s third President in its 40-year history. 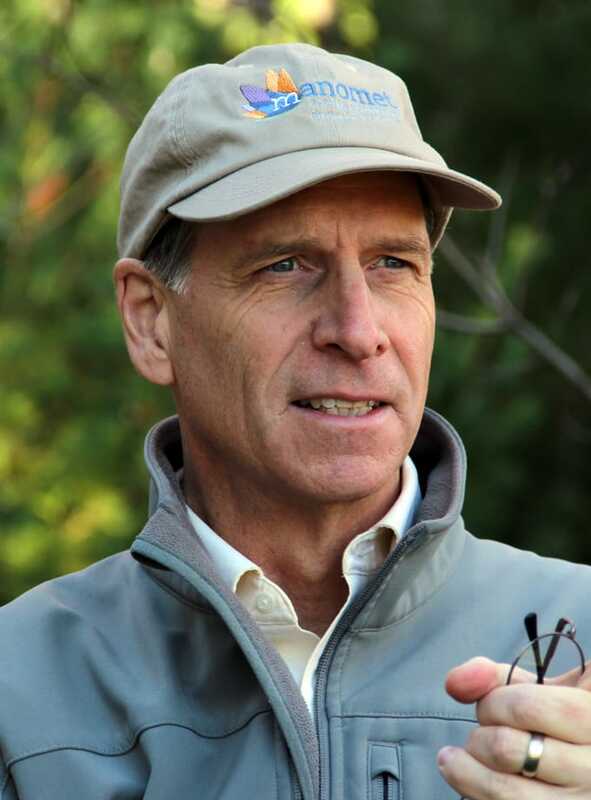 John began his career at Manomet in 1986, when he joined the Landbird Program as a Senior Scientist. He led the analysis of Manomet’s long-term bird banding dataset and organized Manomet’s landmark symposium on Neotropical migratory bird conservation in Woods Hole in 1989. He edited the award-winning symposium volume published by Smithsonian Press. John went on to establish Manomet’s Forest Conservation Program, based in Brunswick, Maine, in 1997. He led a variety of field studies on forestry and biodiversity in the region and helped transform how the forestry sector thinks about protecting biodiversity. His early work on birds and forestry showed that clearcuts can be important habitat for many species of conservation concern. He also showed that modern forest management threatens the persistence of many less charismatic species, such as lichens and mosses that depend on late-successional or old-growth forest. He has worked closely both with timber companies and environmental groups, and is respected as an impartial source of information as well as a neutral convener of diverse interests. With a series of grants from the National Commission on Science for Sustainable Forestry, he helped develop a simple, science-based approach to selecting sustainability indicators that include society’s economic, social, and environmental values. Science serves an important role in our society, but John believes the users of science (farmers, foresters, fishermen, policy makers, rural communities and the interested public) should be involved in shaping how science is done. By engaging the relevant stakeholders at the beginning, through the field work, and then in interpretation of the results, science can be much more effective at leading change on the ground. This is a new way for science, and scientists, to serve the greater public interest. John served as editor of Ornithological Monographs for the American Ornithologists’ Union (AOU) from 1993-1998. He is an Elected Member of the AOU and has served on the AOU Council. He is currently on the Forest Research Advisory Council to the U.S. Secretary of Agriculture. In 2007, he received the Austin Wilkins Forest Stewardship Award from Maine Governor John Baldacci. John received a B.S. in Environmental Science from Texas Christian University, an M.S. in Wildlife Management from North Carolina State University, and a Ph.D. in Zoology, also from North Carolina State. He lives on Georgetown Island, Maine, and maintains offices in both Brunswick, Maine, and at Manomet’s headquarters in Plymouth, Massachusetts.